This is a talk, not a musical performance. 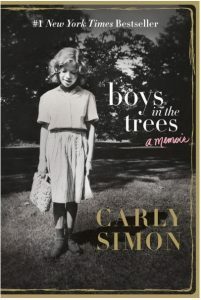 Simon’s memoir Boys in the Trees hit #1 on the New York Times bestseller list when it published last year. She’ll join us on the occasion of its paperback release. In the book, Simon reveals her remarkable life, beginning with her storied childhood as the third daughter of Richard L. Simon, the co-founder of publishing giant Simon & Schuster, to a meteoric career in which she became the first artist in history to win a Grammy Award, an Academy Award, and a Golden Globe Award. The memoir recalls a childhood enriched by music and culture, but also one shrouded in secrets that would eventually tear her family apart. Simon brilliantly captures moments of creative inspiration, the sparks of songs, and the stories behind writing “Anticipation” and “We Have No Secrets” among many others. In conversation with Hanna Rosin, co-host of NPR’s Invisibilia. Book signing to follow.